I so wish I had a photo of the Interstate from our drive this morning. Almost everyone here at the Rally, including Jimmie and Nickie, have horror stories of the horrendous traffic over the Grapevine and on the 210. I was driving, hence no photos. Mo isn’t inclined to grab the camera for pictures of traffic, or the lack of it, and I didn’t think to encourage her. I was too amazed at the ease in which I sailed over the legendary pass and into legendary LA traffic. Somehow our timing must have been exactly right. We left Orange Grove at 7am, fortified with their famous donuts and coffee. It is smart to wait till 7 when the office opens so you can get a couple of those donuts for the road. Another little perk for this place, and they are fresh from the bakery delivered moments before opening, and of course complimentary. As we approached the pass, we could see a light dusting of snow all around the mountains to the south. The snow was at our elevation, next to the road as we reached the summit, even though the temperatures were in the mid 40’s. Glad we waited out the storm, since rumors have it that the Grapevine was closed a few days ago. There are 5 lanes on the pass, two on the right for trucks, and only a very few times did a slow truck in the middle right lane cause me to jump over into the left lane to pass. And yes, trucker daughter Deanna, there wasn’t a car for at least a mile behind me to get frustrated with the 60mph that I managed to do up the hill, only slowing to 55 in the steepest parts. All three lanes to the left of me were almost completely empty until we were within a short distance of the 210 Pasadena offramp. Once on the 210, it was again smooth sailing, with very little traffic. I thought to myself, gee, LA traffic isn’t nearly as bad as I remember. What are people complaining about? We heard a lot of that complaining later in the afternoon as some of the folks here raved about the horrible traffic, the accidents, the complete stops and then stop and go for miles and miles on the 210 even today, after we passed through. Travel angels are with us for sure! The smog even left us this morning, with the folded, tortured and twisted ridges of the San Gabriel Mountains completely clear. By the time we reached our turnoff, the skies were gorgeous, the mountains brilliant in the sunshine, with snow on Mt Baldy, and temperatures here in the low 70’s. Time to peel off the sweatshirts, we are in Southern California! This rally has shifted around a bit since we purchased our tickets last year. Initially we were to be in a lovely county park at a lake in nearby San Dimas, big sites, lovely amenities. Later on, we were told the venue had been moved to the KOA at the fairgrounds. Even later in the process, were were informed that we wouldn’t actually be camping at the KOA, but on the pavement inside Gate 1 inside the grounds themselves. That didn’t sound too good to us, although photos and reviews of the KOA weren’t exactly riveting either. Picture all those overcrowded KOA’s that keep you from going to a KOA if you can help it and you have the idea. Our instructions were to check in at the KOA and then go to Gate 1 to find our group. I do have to say that once we saw the KOA and then once we were settled into our spot here in the parking lot, we were quite happy to be right here where we are. 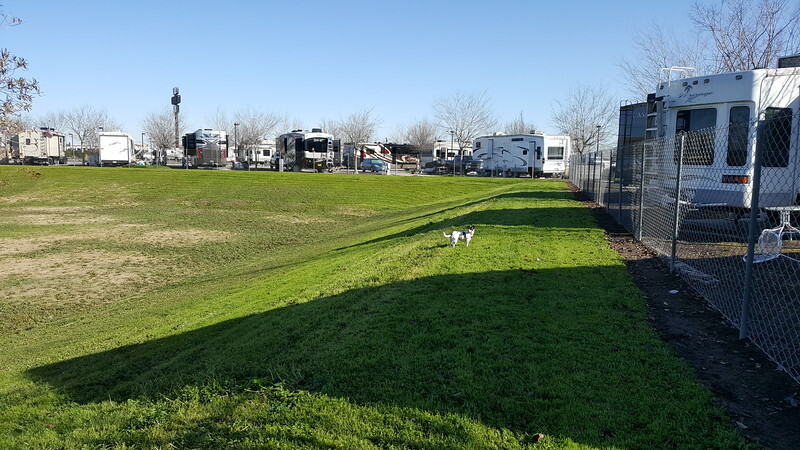 We may be on pavement, with no picnic table or trees, but we are parked along a large grassy space with plenty of room to walk the dog, set out our chairs when we get around to it, and enjoy the sunshine without all that crowding. Twenty Seven rigs are lined up here, with 54 people attending the rally. Many, like us, are first timers, but there are also about half of the group who have traveled with Adventure Caravans more then once. 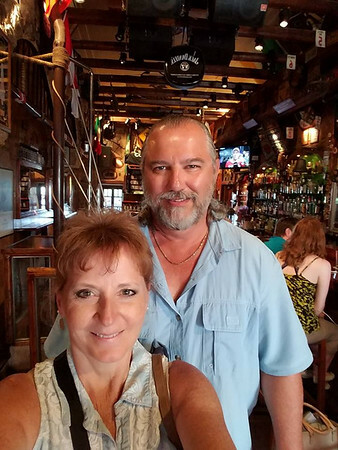 One couple from South Carolina have been on 31, yes 31 tours with Adventure Caravans. Sheesh! I think there were several others who, like us, didn’t want to deal with the logistics of the parade and yet still dreamed of seeing it, either once again to rekindle childhood memories, or for the first time. Of course, during the orientation, there was the obligatory “Stand up and tell us who you are” thing that Mo really doesn’t like and I tolerate. That is how I know why people chose to come on this Rally. And Melody, just for you….one gentleman and his wife introduced themselves and said that they had been very busy campaigning for Hillary. Of course several people popped up and said they voted for Trump, but several people also cheered Hillary. So everyone isn’t of the same mold, which is nice. Hopefully that is the last time that political conversations are part of the entertainment. After we arrived, Mo and I decided to go to the RV show across the street. Everyone was just soooo sooo friendly here at the rally and we weren’t quite ready to be all that social, so we escaped. The “huge” RV show wasn’t all that huge, but we did enjoy checking out the new AXIS rigs, nice size at 24 feet, with a big class A type window that could entice us. But in order to keep the price point reasonable, they don’t have many of the niceties that we have in the MoHo. We are so dang spoiled, so even with 90K miles and 9 years on her, we are in no way ready to give her up. Our “wagonmaster” Hex has been great. We managed to get the only site that has only 50 amp posts, and we don’t carry a converter. Within 5 minutes, Hex had one for us. He also recommended a service being offered by Adrian’s, who was washing and waxing rigs. We have always done our own washes, and have never succumbed to this kind of luxury. We decided to give ourselves a Christmas present and paid $150. for the most amazing cleanup we could imagine. The rig was washed and waxed to perfection, including the roof, and all that water spotting that I could never get off the windows completely is gone! Worth every penny. I am sure we won’t do that often, but it sure was fun. The MoHo looks brand new! 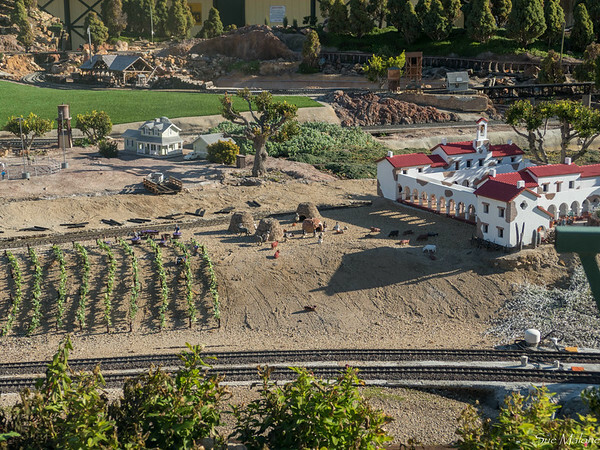 As I walked around the complex, it began to dawn on me that I was standing next to the original garden railroad exhibit that was at the heart of the LA County Fair. I stood here as a kid, enthralled by the trains and the miniature buildings. I took Mattie walking around the empty complex, the huge buildings that house the exhibits were built in 1938 by the WPA. This fair, every September, was my annual birthday celebration. Our family always had 6 little foster kids, always younger then me, but for this one outing every year, the kids were left at home with mom, and dad took just me to the fair. I looked at the huge buildings, one for flowers, one for vegetables, one for housewares, and then walked out to the animal barns, now empty, but filled with memories of the Budweiser Clydesdales and huge pigs and cows and sheep. Whenever I go to a fair now, it is always colored by memories of this one. Nothing can measure up. It was crowded even then, back in the 50’s. I can only imagine what a zoo it must be now, and have no desire to repeat the experience. Walking alone around the buildings and walkways and midways and barns was a perfect way to relive the memories. Later in the afternoon, after Jimmie and Nickie arrived, we settled into the big tent for “orientation”. The previously mentioned introductions were part of the process, and then all that other stuff that seems to go with any kind of “tour”. 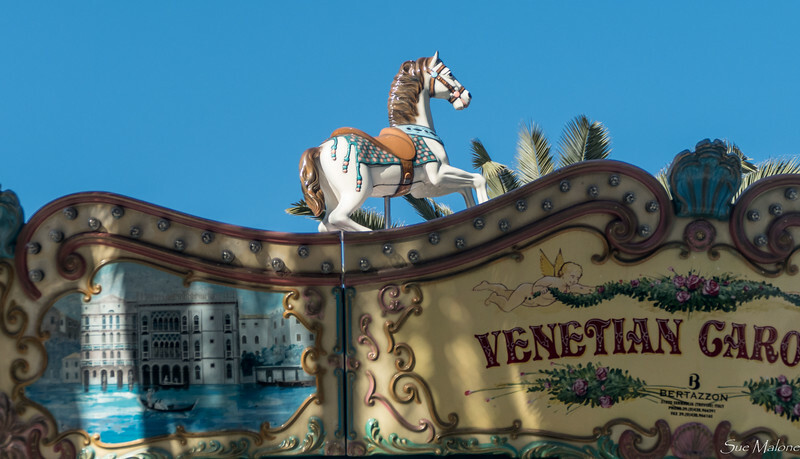 A few itinerary changes, the most disappointing being the EquestFest horse show. Seems as though there is some kind of equine herpes virus outbreak going around and in order to protect the horses, all horse festivities prior to the parade have been cancelled. Sigh. Raincoats are in order, however, and that is another sigh. It has only rained 10 times on this parade, with sometimes more than 50 years between rains. The last rained out parade was in 2006, and this year the weather predictions do not look good. I guess we need to appeal to the weather angels to hold off just a bit. Please? For several winters now we have managed to travel south around this time of year. 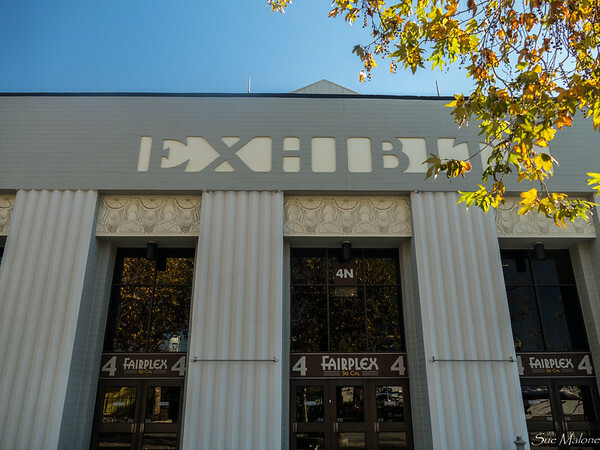 It is familiar territory, and takes a bit of effort for either of us to step back and appreciate that 300 miles or so between Lodi and Bakersfield, to see it with new eyes. As is often the case, even on a clear somewhat sunny day, there was a bit of murk in the air, especially east toward the Sierras. We are used to that. We are used to the rattles of the poorly maintained pavement of I - 5 in this part of California. Sometimes there are smooth stretches, with recent repairs, but more often than not the MoHo rattles and shakes and bangs when we hit road divots that should be on a back country road somewhere. We held our noses as we passed the huge feed lots near Harris Ranch, a place where we once stopped for a steak dinner on Christmas Day. We stopped for a few moments at the rest area near Coalinga, built with thought and care with local materials to look like the old agricultural buildings that have been part of this landscape for more than a century. Again I drove up the little knoll to a vista point that gave us a view of the dual ribbon of the interstate stretching south into the distance, as far as the eye could see, thick with cars glinting in the sunlight, moving in both directions. Today, however, there was just a bit of difference in the way I looked at the broad valley stretching toward the east from our elevated highway along the foothills of the coast range. I recently discovered an environmental writer, a crazy guy that lives in Yucca Valley, and he speaks to my heart on so many things. Chris Clarke writes like Ed Abbey mixed up with a touch of Terry Tempest Williams. The article that broke my heart was one I read recently, describing the paradise that was once the California Great Valley, as it was before corporate agriculture took it over. I know we need food, but still…do we really need to export all the almonds in the world at the expense of our land and our water, to make a corporation richer? I mapped soils in California, I know how beautiful it can be in so many places. I have seen bits and pieces of the valley that hint at what once was. But this verbal visual picture of what we have completely lost made me cry when I read it, and today as I drove south along that valley, I remembered Chris’s words. If you want to read something beautiful, and heart rending, and important, read this article from his Coyote’s Crossing. We were slowed by two large accidents, one semi that looked like maybe someone had fallen asleep, or as my trucker daughter said, maybe texting. The next accident looked as though it may have been a couple of cars that decided to change lanes one time too many and into each other. Traffic was fast and crazy, and lane changes were frenetic. I was happy to see no ambulance at the second wreck, and to see a woman holding her big white dog in her arms as she stood next to her upside down totaled van. We left at 7:30 am, allowing enough time to cover the miles and not worry about arriving after dark and by 3 we were parked and set up in Orange Grove RV Park, east of Bakersfield. I have no idea how many times we have been here, but it is quite a few. The oranges keep bringing us back. In keeping with our techie issues, Mo discovered this morning as we left frosty Lodi that the Tracker was dead. With a pull through site, we hadn’t unhooked, and decided to just pull her along until we arrived at Orange Grove. The park here was mostly empty, we pulled in straight, unhooked and I pulled the MoHo out and backed in, battery to battery. In minutes, the Tracker was purring again. We had left the fan on the last time we drove it and with the key to “accessory” in order to stay in park and still allow the steering wheel to turn, the fan was on, quietly enough that we didn’t hear it. Dead Battery. It has happened before, but not too often. The fix was easy, thank goodness. Then we set up the satellite, with the phone at hand ready to call King. In minutes we had both satellites, a great signal, and Direct TV channels popped up just fine. Nothing was different than yesterday afternoon, and yet for no reason we could figure out, everything worked just fine. I simply have no clue, but here we are, dinner in our tummies, a good glass of wine, and the news keeping Mo company while I write. Somehow, everything that seemed to be a problem yesterday has been resolved today, without any real effort. I love it when that happens! 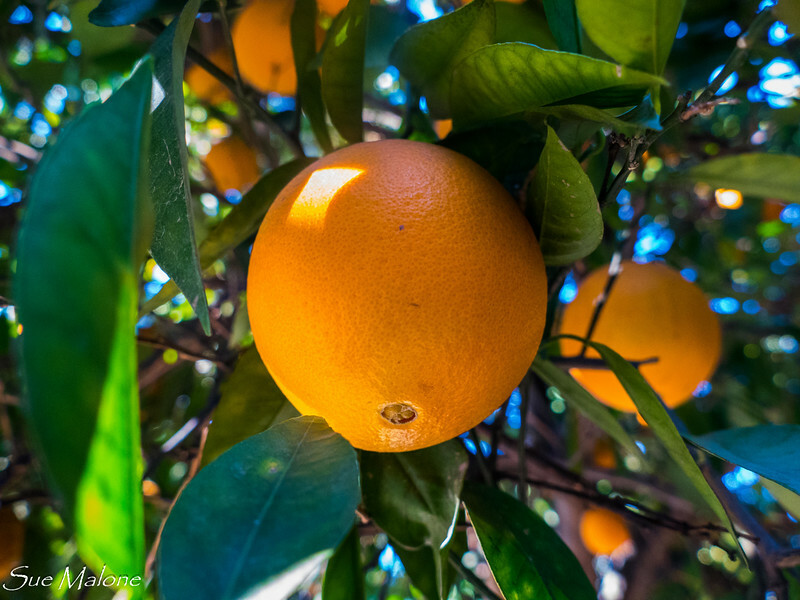 Not long after we arrived, I was out picking oranges, with an extra bag tucked away for Nickie and Jimmy, who are now settled in a bit north of us in Wasco. The oranges are bigger and thicker and even sweeter than I ever remember. Even though things were empty when we arrived, the staff warned us that the park would be full to capacity tonight and in the next few days would no doubt move into overflow only. Whew. Don’t try to come here without a reservation. Tomorrow we will drive the infamous Grapevine, a highway I remember from my childhood trips to Yosemite. Back then, in the 50’s it was an 8 hour drive over the mountains to Fresno, a wild and curvy drive, hence the name. There are still some pieces of the historic highway left for motorcyclists and hikers. Ah such wonderful memories, waking at 2 am to tuck into the back of the 52 Buick with blankets and pillows as my dad drove that winding road, watching the sun rise as we dropped down into the Great Valley. I had no more finished publishing the last post than things started changing. First of all was a sweet solution to the Mattie problem. 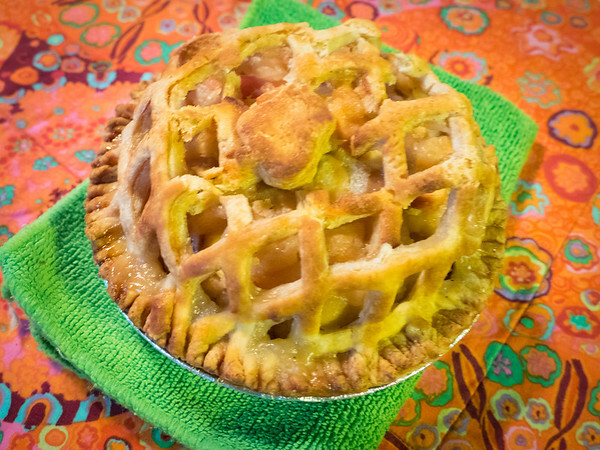 Our blog friend Laura read the post and immediately wrote saying she might have an idea. I met Laura last summer for lunch in Ashland when she and Alice were traveling. We had followed each other for some time and it was great to get together and meet in person. Laura is a dog person, and a motorhome travel person, and since she lives near the Pomona fairgrounds, she sweetly offered to come during the days we had to be away and take Mattie for a potty break and a walk. Amazing! We have open skies to fiddle with the satellite, paved space to keep out of the mud, a nice big doggie park, and sunshine. With our Passport America this park is only $27 per night. I really do need my oranges, so we will still go to Orange Grove, but for one night only. Oranges for $17 bucks extra and 25 miles out of our way. They really ARE that good. Next up was going to the park office to pay for two nights instead of one. I asked about the TV thing, and sure enough, this past year they upgraded to digital. At the moment, Mo is outside hooking up a very long cable that we can bring inside so that we can hook up the digital converter box and hopefully will discover that it actually works and we can get digital cable from the park. Our other techie problem is our TV antenna. It isn’t digital either, so when the girl at the counter said, “Just put up your antenna and you can get 45 channels from Sacramento”, we just smiled. Mo purchased a digital antenna long ago to replace the original one, but it didn’t have room to retract on the top of the rig, so she removed it, so no, we don’t have a digital antenna either. Technology shifts so fast you can’t be slow! We do have a digital to analog converter, but so far the problem has been figuring out how to make it actually work. It is now noon, and we have given up. When we hook up the box, it can only be seen on input 3 and cable can only be seen on input 7, and when we program the box on 3 we get a bunch of strange channels that the maintenance guy can’t figure out at all, not the regular digital channels that come across the Direct TV cable. It is all too weird. Solution? Figure out how to get a digital TV in the space that we have and for the time being, forget about TV! A big glass of wine should get us to the next project….getting our King Flex satellite to work with our new Direct TV receiver. A BIG glass of wine. A bit later, after the wine and lunch, we tackled the King Flex satellite system. The system worked fine for a few years, since we got it in 2014, so it obviously isn’t that old. Last year, when we had to upgrade our old Direct TV receiver, it quit working. After a long day on the phone, I learned that it needed updating, and King sent us a big update file that had to fit on a 4 gig or less USB stick. You can’t buy those any more, but I did manage to find one buried in an old drawer. We upgraded the system, but it still took a long time on the phone to get it to work. That was back in May. When we traveled last summer to the family reunion, for some reason it would no longer work. Direct TV isn’t very helpful because they don’t understand how these RV satellites work, and they keep wanting us to do things related to the big satellite at home where the system works just fine. Sigh. So this afternoon we hooked the system up again, with completely clear skies, and in a fairly short time the converter showed full reception on the satellite system. The Direct TV receiver, in spite of tracking the numbers of the transponders, still said there was “no signal”. I forgot this was a holiday, but was reminded quickly when I put the call into King. They are closed for the holiday. Of course. So we put the satellite away, put the non working cable digital converter box away, turned off the TV and spent the afternoon laughing and playing cards. In spite of the tech issues, it has been a lovely day of down time. There haven’t been many down time days in our life lately and that is the one thing we can count on when we get away in the MoHo. We will usually manage to have some quiet days without a lot going on. 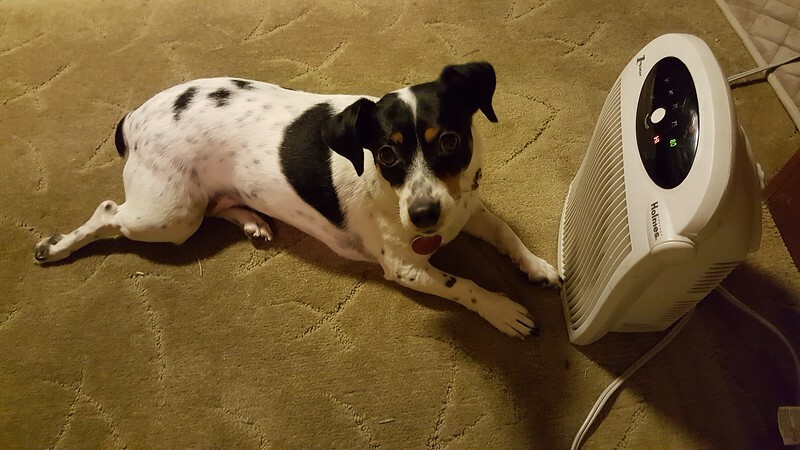 Much like being on a cruise, we have learned after more than ten years of RVing that you don’t have to keep running around doing everything all the time. Whatever wonders may be out there will still be there next time. We could have dressed to go wine tasting (we love Old Vine Zin’s which Lodi does better than anywhere). We could have visited the Jelly Bean factory. Instead, we hung around home, and thoroughly enjoyed it.. 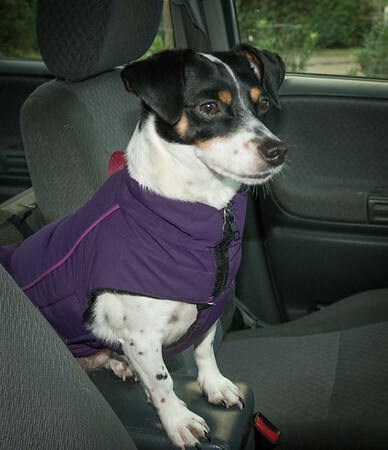 It is still fairly chilly, even with the sun shining, so I wrapped up in a warm coat to take Mattie to the dog park. The “park” is simply a fenced storm water control basin, but is full of grass and good smells with lots of room to run. Surprisingly, both times we visited the park, there were no other dogs around so Mattie had the place entirely to herself. Today there were only a couple of Snowy Egrets pecking around, but last night there were more than a dozen, including three Great Egrets as well. Their view from this spot certainly isn’t what our Klamath Basin egrets enjoy! 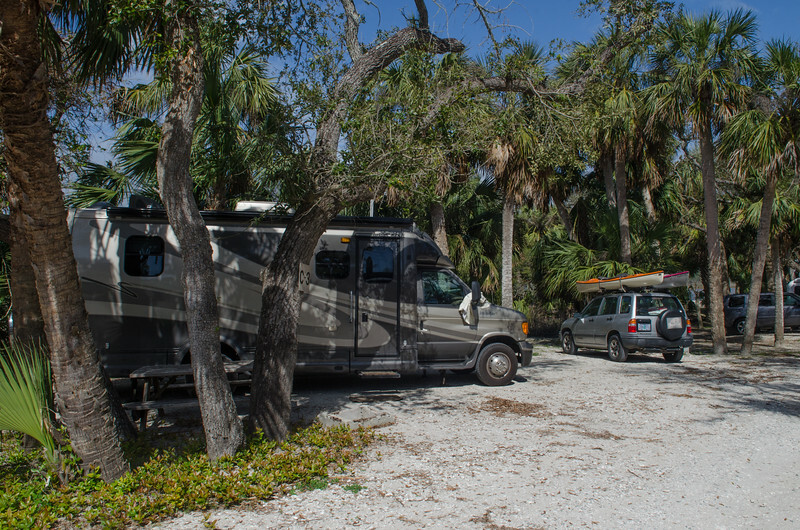 Our plan now is to leave as early as reasonable tomorrow morning with hopes that we will get to Orange Grove RV in time to set up the satellite again, and make the call to King on the east coast before they close. Mo is a lot more patient than I am with all this stuff, and after things don’t work I just throw up my hands. She wants to keep trying. Our testy comments to each other are good natured most of the time at least. I just want to buy all new stuff and have someone make it all work. Mo, in her best thrifty fixit self, wants to make what we have work. Most of the time it eventually does work out. I guess we will find out tomorrow! Now, for those of you who said you were glad I was posting again….really?? Hopefully as the week progresses there will be more interesting stuff to talk about. This trip has been in the making for almost a year. 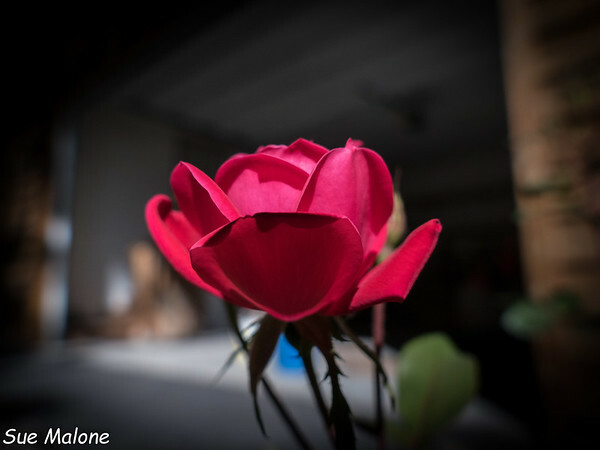 While we watched the Rose Parade in 2016, I remembered the fragrance of the flowers from all the years that I attended that parade growing up in Southern California. I once again said to Mo, “We have to get back to the Rose Parade someday”. I have no idea how Adventure Caravans showed up in that picture, but on January 1 2016, we booked our very first formal “Rally”. I thought that we could “do” Christmas with the family before we left, but as is often the case when traveling south in winter, weather stepped in and changed those plans. 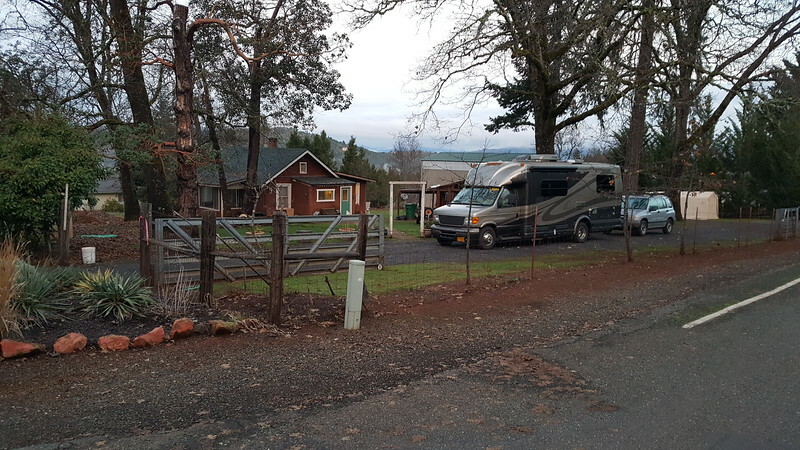 The MoHo is stored safely at the Cottage in Grants Pass, protected from Klamath Basin snows and extreme cold. Instead of three passes to get over to go south, she only has to manage two. Mo and I, however, still have to get over the High Lakes Pass. 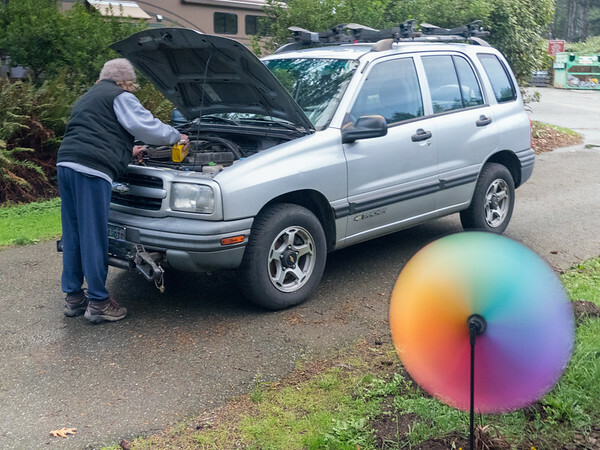 It isn’t a problem most of the time, especially since the vehicle that makes the trip back and forth to Grants Pass is our trusty little Dakota. This year, however, a “big” storm was predicted for the day we planned to travel, with an even bigger storm coming over the Siskiyous and Mt Shasta. Our plan to head south on Monday the 26th began to look like a real fiasco. Instead, we decided to skip the Christmas festivities and use the tiny little window of clear weather and open passes to get to California. 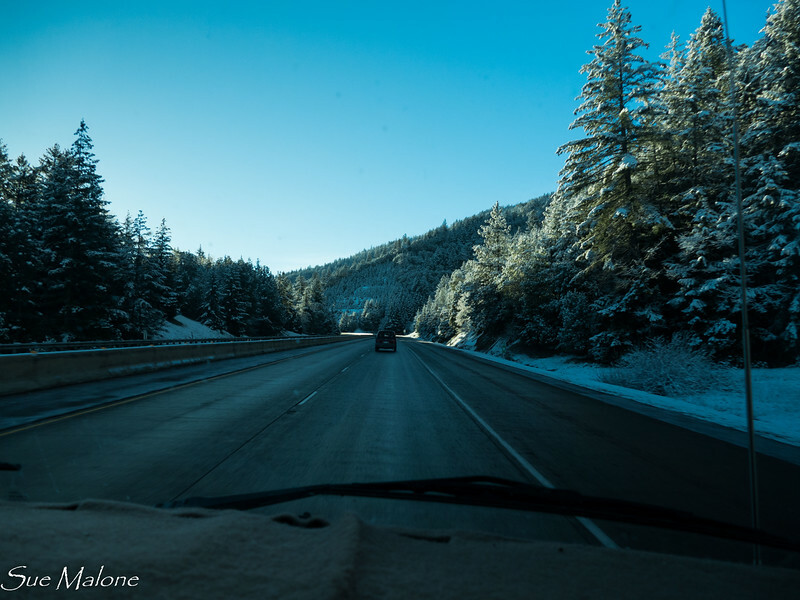 After a sweet early Christmas Eve Eve celebration with Melody’s family at the apartments, we loaded up the truck and managed to get over the snowy High Lakes Pass without a hitch. Whew! With an extra day to prepare the rig for traveling, Christmas Eve was enjoyed with a nice long visit with Daughter Deborah and Grandson Matthew. So instead of the big family celebration with food and photos, we had special times with each family before beginning our southern adventure. I love being in Grants Pass in the winter. It can get frosty and foggy, but when that clears and the sun shines, it is pure gold, and the grass is gorgeous and velvet brilliant green. That same grass goes dormant in the hot summers, but oh what a treat on a cold winter day to see green grass all around. Nice too that it is cool enough that it doesn’t grow fast enough to need mowing. We woke on Christmas Day to cloudy weather and a gentle sunrise and temperatures above freezing. What a delight! Even more delightful, as we merged onto the Interstate from the Rogue River Highway, there wasn’t a car in sight! I have never in all the years I have traveled this road seen it as empty and quiet as it was at 8am on Christmas morning. South of Ashland, the Siskiyou Summit is the first hurdle encountered on the route south. It is long and steep, and can be a tough pass, with chains often required during the winter. We sailed over the Siskiyou’s, with roads clear and almost completely dry except for a very few bits of ice at the top. Down the southern slope are some steep grades toward Yreka, and then the valley opens up to views of Mt Shasta to the southeast. Clouds obscured the mountain a bit, but she loomed white and brilliant over the landscape in the morning light. 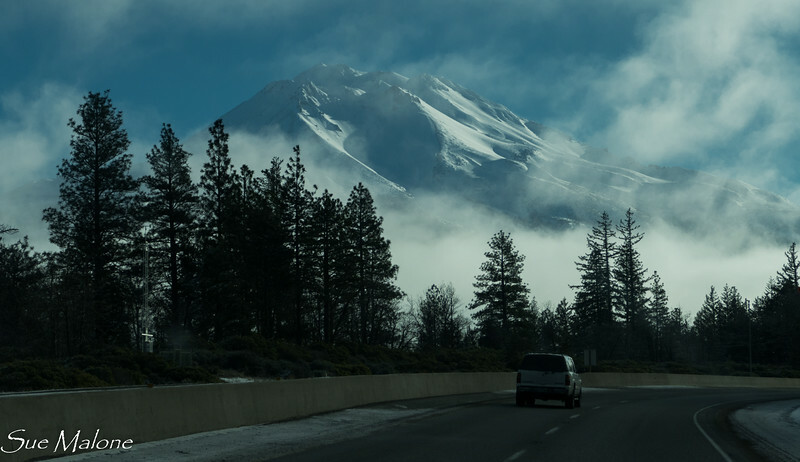 The pass over Mt Shasta isn’t as dramatic as the Siskyou Pass, but it was colder and more icy between Weed and Dunsmuir. That part of the highway can be treacherous, with lots of semis negotiating the curvy interstate and weather often choosing to slam into that southfacing slope with a vengeance. Once again, we sailed past Shasta and Dunsmuir without a hitch, across the gorgeous new bridge that has been years in the building over an arm of Shasta Lake and then into Redding. We both agreed it was the easiest most traffic free I-5 trip we have ever managed in all our years of driving south on this route. With the plans moved up a couple of days, we then had to decide just where we would spend the extra night. Our first stop on this route almost always seems to be the Flag City RV Resort in Lodi. It is quick and easy, a Passport America Park, with level pads and no reservations needed. However we decided that we weren’t up for wine tasting in Lodi and wanted to continue south today after a single night here. Originally I thought we could boondock at the Flying J on the north side of the Grapevine before heading into Los Angeles early Wednesday morning. I looked for something along the southern route that might be worth spending an extra night, and found nothing we wanted to do. Instead, we decided to go a bit off track toward the east to our favorite stop over on the way to the desert, Orange Grove RV Park. Mo laughed and said, “You just want to go there to get oranges!”. She was partially right, but it really was the best choice, both for comfort and price and an open sky to fiddle with our satellite on the extra day we will spend there. Now the plan is to spend the next two nights there, and leave early on Wednesday morning to return to I-5 and the Grapevine, south toward the 210. Somewhere along the way that morning, I wouldn’t be surprised if we see our buddies, Jimmy and Nickie traveling south as well. We are all supposed to arrive at the Pomona Fairplex KOA by noon on Wednesday. Who knows what we are in for. The rally people have communicated often, mostly by email, with different suggestions. The campground venue changed from the original beautiful park in San Dimas to this KOA in Pomona. Not optimal because instead of being half an hour from Pasadena it is now more than an hour. (The change was made AFTER the trip was paid for!) We then got a communication from the rally “wagonmaster” that we would be actually camping at the fairgrounds, not in the KOA itself? What? They told us that dog sitting was included, and later mentioned that was an extra fee. We reviewed the papers required by the dog sitters and thought, No. No way. The fine print states that they are not responsible for death of your dog if attacked by another dog while they have your dog out with them, among several pages of other sorts of liability releases, including damage to your rig while they have the keys. No thanks. Mattie will have to manage on her own on any of the long days we are away from the MoHo. No matter what, the Rose Parade is the goal of the trip, and the minor details are just that, minor. Sitting in the bleachers smelling those flowers and listening to the marching bands will be wonderful, and no traffic and crowds to negotiate. All handled by our rally wagonmaster. Should be a real treat. Thanks to my friend Erin, I am trying something different for the blog during this trip. Both of us are often slowed in our writing process by the time it takes to select and process the photos we want to use to illustrate our stories. Erin has decided to write more and worry about photos less. Her reason for doing this is probably a lot more valid than mine, since she will be on a ship, but it still will work well for me. Check out Erin’s upcoming adventure here. I pay for bandwidth to upload those photos to SmugMug, and would much rather process all those photos at home on the big computer. My laptop also has Lightroom on it, but oh my it is sooo slow. I am spoiled with the hefty GIS ready desktop that I have at home, so will wait to process and add photos when we return to the apartments. I am sure that 99 percent of those reading this blog will NOT return to see the rest of the photos, so there you are. You will get a few, but the rest will come later. Thanks for the great idea, Erin! Now for a little bit of mechanical misery. Our rig is almost ten years old. It is a fabulous rig and we love her, but one problem that seems to keep cropping up are issues with the jacks. Mo had the solenoids replaced and pump rebuilt last summer. The jacks work just fine at the repair shop, but then when back out on the road, they refuse to extend, most often the rear jacks. Our site was level, but we still wanted to work with them to be sure all was operating well. Nope. Not extending. Mo crawled under the rig and fiddled, pulled them down manually, and put WD 40 on them. They worked again, after being cleaned a bit. All that road grime and snow stuff must get in there and make them sticky. Hopefully they will work when we get to Catalina Spa after our Rose Parade week is over. We love that place, but the sites are notoriously not level. More misery with television. I almost hesitate to talk about this, because it shows our unwillingness to move into the current technology. The rig is from 2006, so our tv is a lovely flat screen, but is not digital. 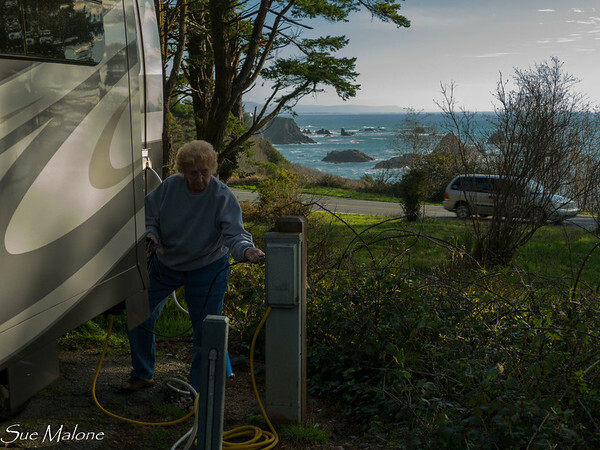 Lately it seems that many of the RV parks are moving to digital cable that either requires an expensive box rental from the cable company, or a digital tv. Last night we couldn’t get tv to work at all, and of course since no one was around on Christmas day, we have no clue if it is us or them. Many folks in the park seem to be using their own satellites, but we didn’t want to fiddle with that for just one night, so no TV. Thank goodness we have our own WiFi. From the review that I read, while WiFi is supposedly available, it never works, and some people said the cable doesn’t always work. Maybe they didn’t have digital tv’s either? We hesitate to replace the TV because the current one is somewhat square and the newer digital models are longer and won’t fit properly into the perfectly shaped cubbyhole that we have now. It would require a much smaller screen or a complete redo. Of course, if we could get our satellite to work properly with our Direct TV box that we bring from home that would help as well. That is another mechanical issue we plan to address tomorrow on our layover day at Orange Grove, remember those open skies I mentioned? In the mean time, we have a lovely sunny day ahead of us to travel the short distance to Bakersfield and Orange Grove RV Park. No worries, we will travel the 5 rather than the 99 freeway just because we like it better. The mileage difference is miniscule. It is raining hard right now, and the wind is blowing. It rained all night and most of the day yesterday. Mo and I laughed about how much fun it is to be rocked to sleep in the dark listening to the sound of rain on the roof. Not something often experienced in the stick and bricks. We expected rain when we set forth on this journey. 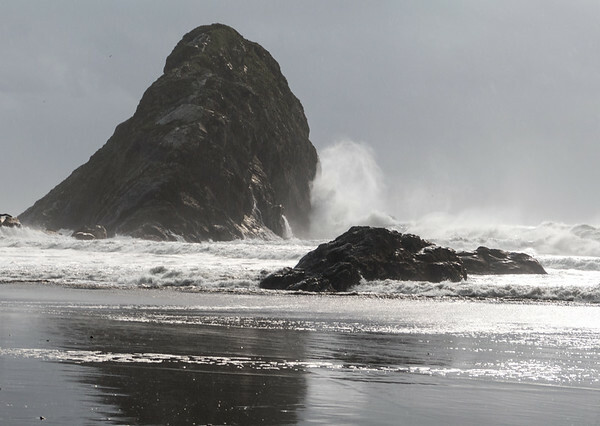 The predictions were for rain and gale force winds in Brookings, with small craft warnings all up and down the coast. 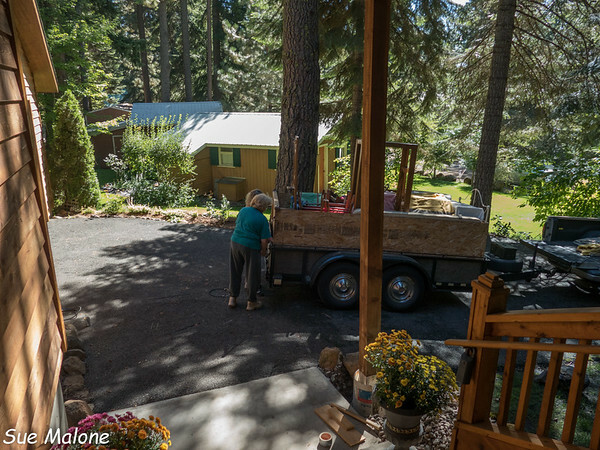 We left the apartments in Klamath Falls on Wednesday morning, leaving behind a skiff of snow as we headed west for the cottage and the waiting MoHo. 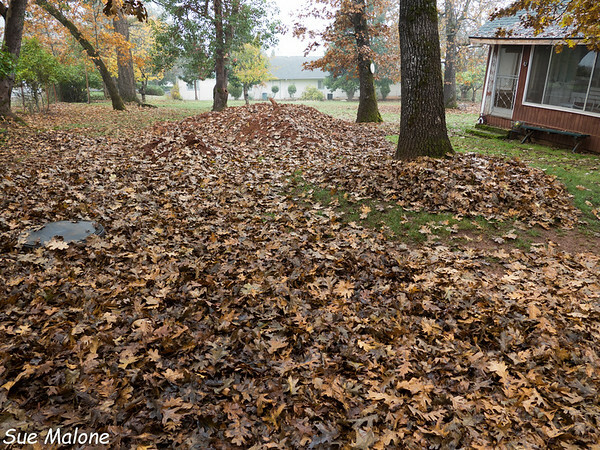 I spent most of the afternoon in Grants Pass raking up more leaves, but the good thing was that at last the huge oaks seemed almost completely bare. The neighbor across the way came over to talk and said, “At least this should be the last time you have to rake.” Yeah, maybe, but there are a LOT of leaves waiting to be hauled off, all scooted off the grass and to the long driveway, hopefully they will still be where I put them when we get back to Grants Pass. Rumor has it there was a huge storm there as well, with lots of wind. Cozied up in the cottage, for a moment we questioned our sanity. Are we really heading for the coast and a big storm instead of laying low? The answer was a resounding “Yes”. Every time I moved the MoHo out of the RV shed when we were unloading “stuff” from Rocky Point, I would smell that familiar MoHo smell. Familiar, comfortable, a reminder of almost ten years of happy times cozied up in that sweet little rig. Couldn’t wait to get out again after such a long hiatus. 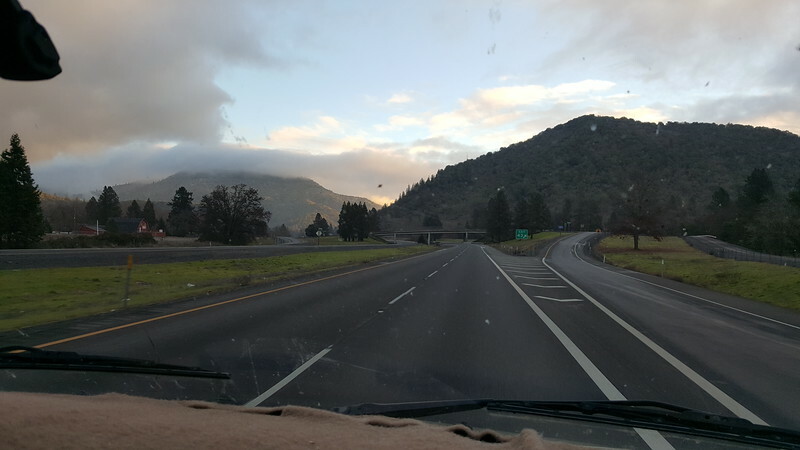 When we left Grants Pass on Thursday morning, the skies were dark and gray, and we fully expected to be fighting rain and wind all the way. There is a big tunnel, just beyond the California state line, and as we entered the tunnel it was cloudy, and when we emerged on the other side, the skies were a brilliant blue and the sun was gorgeous. It was the strangest thing. I was driving, so didn’t get any photos, but the winding road along the Smith River was breathtaking. The canyon is deep, with incredibly steep mountains along the river, and much of the highway was darkly shadowed where the sun never gets high enough this time of year to touch the river. Then from that dark shadow we would emerge into sunlight so blinding that it was hard to see. Talk about contrast. The skies were bluebird blue all the way to Highway 101, with just a bit of cloudiness visible in the distance on the ocean horizon. 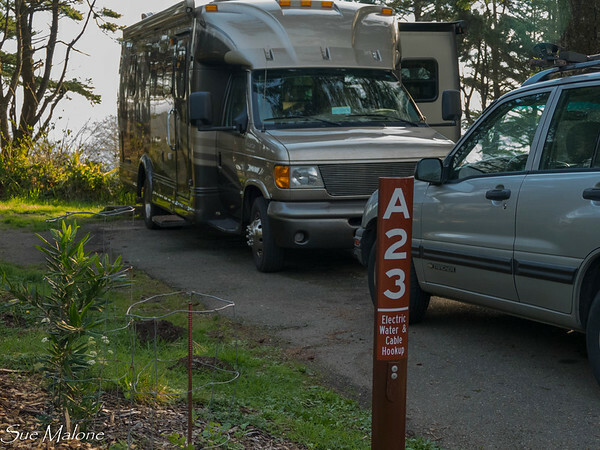 We arrived at Harris Beach State Park around 2pm, without a reservation on a mid week day. In spite of the season and the weather, most of the front row ocean view spots were already taken, but we got lucky and slipped into one of our favorite sites, A23. There were three rigs right behind us. Lots of space still available in the park, including sites with cable, so they found a home as well, just not as perfect as ours. 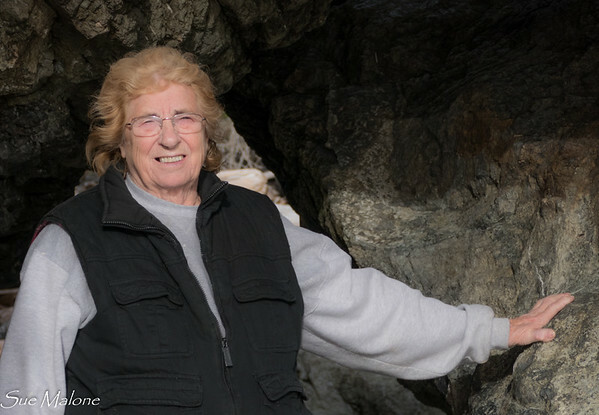 After visiting Judy at Harris Beach State Park in the summer of 2015, and reading her blogs about how she felt about spending that summer as a volunteer, (discussing the down side of crowded conditions and summer fog) we were glad that we were here in the off season. 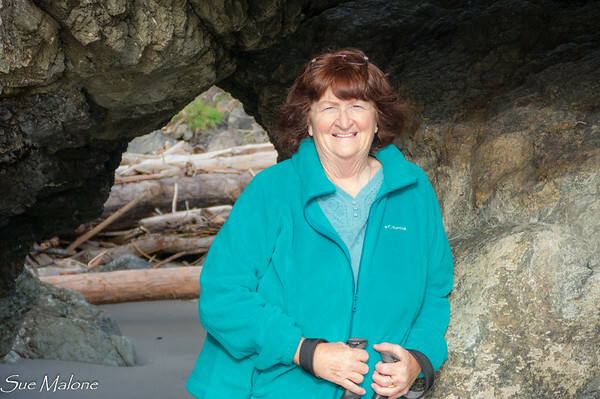 Suzanne of Take to the Highway, had trouble finding a spot when traveling during the summer as well and it seems that our opinion and love of Harris Beach State Park is colored by the fact that most of the time our visits have been off season, often in November, December, and early spring. Dinner for our arrival night was already determined, “Fish and Chips!” Our little Chetco Café and Seafood place where we have enjoyed so many great fish and chip meals is now closed. Instead, in the same area of Brookings Harbor, we returned to a previous find, The Hungry Clam, which had a tremendous plate of halibut and chips. The only thing about this little spot is that they have no liquor license, so a glass of wine or beer with the chips isn’t possible. Still, it was a great meal, and the leftovers fed us for another night at the beach. Another stop at a favorite local gift shop, “Feather Your Nest” yielded some goodies for my Rocky Point Ladies Luncheon Christmas table decoration that will be coming up soon. By the time I returned home, Mo and Mattie were ready for an outing. We decided to take Mattie down the South Beach trail for some sand time. Walking toward the north instead of the south, the familiar sea stacks welcomed us back home. Everything looks much different this time of year, when the leaves are gone from the shrubs and the skies are wild and gloomy. There was still very little wind, and once again we discovered that the winds up on the bluff where the park is located are sometimes completely absent down on the beach. 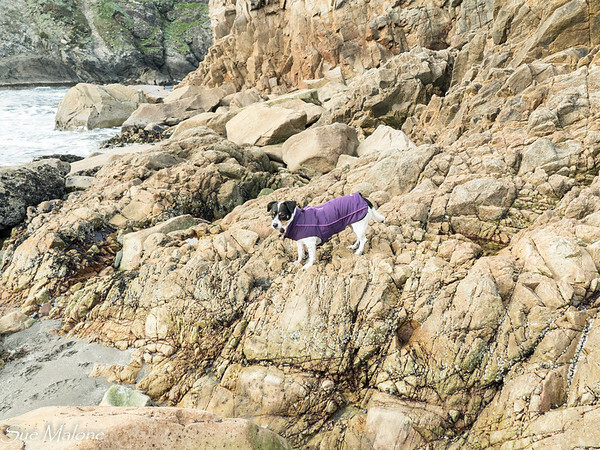 After some time there, later in the day we decided to try the dog beach at Maklin Mill Beach. 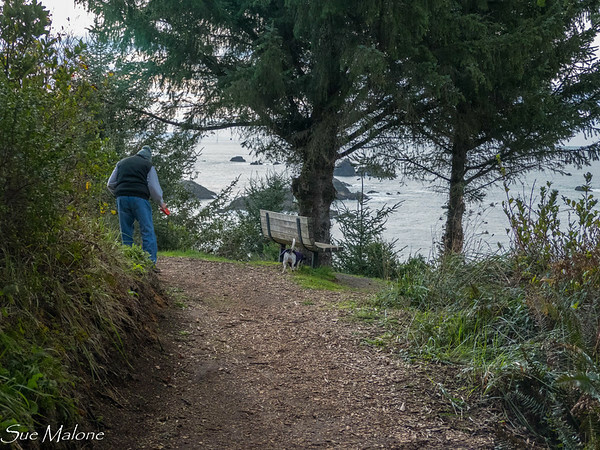 There is no leash law here and people love to bring their dogs for play time. Mattie was beside herself excited, and there were lots of dogs around, but this time we found no friends for her to play with. A few big dogs, with owners who kept them at a distance, and one little six month old Jack Russell who was a bit scared of Mattie’s exuberance. Friday evening the rains started in earnest and the predicted winds were wild. I did spend a moment or two wondering about the big trees near the MoHo during those winds, but everything held and we had no problems. Something I have noticed, is that our slide awning seems to be resistant to the flapping problem that people often talk about during wind storms. We didn’t have to pull in the slide in spite of the wind. Saturday morning was stormy and wild, and Mo and I decided that it would be fun to try to get in between the rain for a beach walk. The skies kept changing and the wind made the weather dramatic and fun instead of simply dark and boring. Instead of walking the long slope down to the main beach, we took the Tracker down so we could escape the rain if needed. Mattie was excited to be on the beach for about five minutes. No one was around, so we took her off leash. The rain started up, pelting us in the face so hard it stung, and Mattie decided that this was just plain stupid and took off back up the ramp toward the car. All the calling and coaxing couldn’t convince her that the rainy beach was a decent place to be. 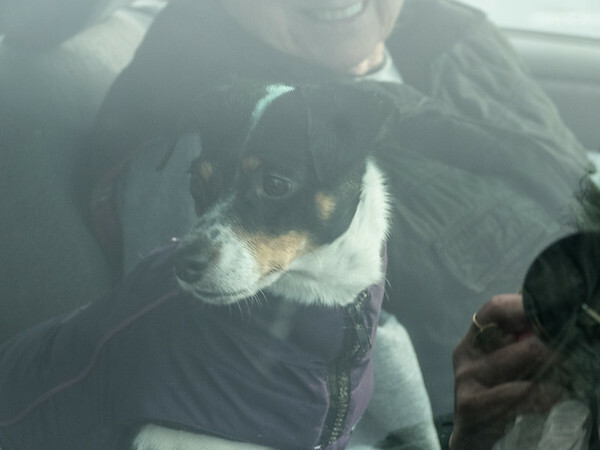 She and Mo took refuge in the car while I kept walking a bit to try to get some photos of the wild surf. Taking photos in a rain storm can be a bit daunting, but I would hide behind a rock, pull the camera out from my waterproof coat for a fast shot. The weather was exhilarating! I decided then and there that I love the coast more in the winter than in the summer. 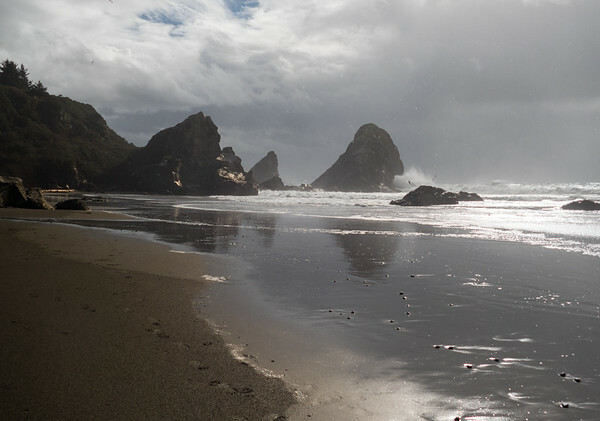 Summer beaches should be Caribbean or Floridian in nature, and the Oregon Coast is always wild, summer or winter, but at least in winter it is mostly empty. 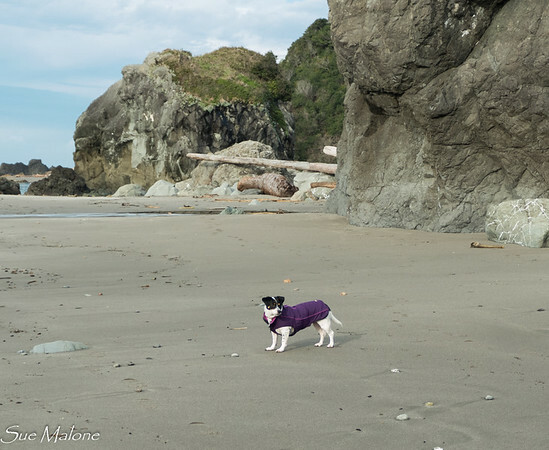 After that little weather moment, we decided to try Mill Beach once again, and surprisingly, we got a parking place right at the beach, and the wind was much less crazy than it had been back at Harris Beach. We walked for an hour and a half with Mattie off leash most of the time and no other dogs to worry about. The surf was crazy wild and gorgeous. I included this photo for the wind effect. See how fast our flower is spinning?! Our planned entertainment for Saturday afternoon was some time at the Lucky Seven Casino, just a bit south of the California border in Smith River. We had visited this casino a couple of times in years past, but it was quite a surprise to see all the remodeling and rebuilding that has happened since we were last there. The gaming areas are a lot bigger, and the slot machines are a lot fancier. Big things, and all 1 cent machines which we love, but the fine print is that the minimum bet on most of them was between 40 cents and a buck and more. I guess they have to pay for all the fancy new stuff. We aren’t big gamblers, and usually I am only willing to shell out 20 bucks for some entertainment, and if things are good, maybe 40 bucks. I never plan on winning and sometimes I do, but at least I get a bit of fun for a time. This casino wasn’t that much fun, in spite of the glitz. We lasted about an hour before leaving with our free machine cappuccinos. Probably won’t have to go back there anytime soon. Once again we were rocked all night with wind and rain, and woke to a gray Sunday. After breakfast I made another run to the wonderful bakery, open on Sunday! 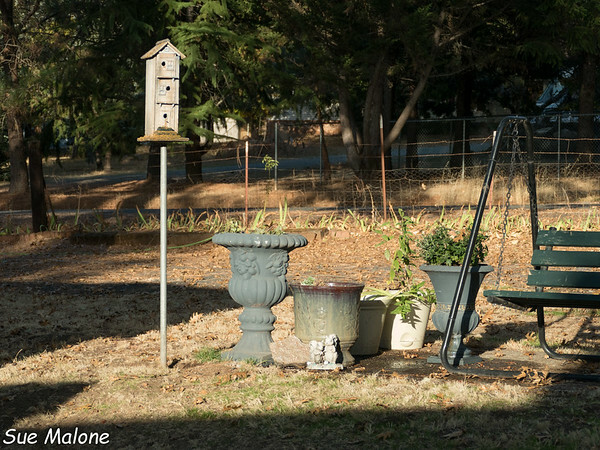 Home to processing photos, and writing this blog, and now as I look outside, the winds have parted the clouds. I can see the wild surf below us, and I am sure before long we will attempt to convince Mattie that walking on the beach with imminent rain isn’t as bad as she thinks. Current Location: Klamath Falls Oregon, at 40 degrees F with snow coming tomorrow. For me, May and October are the very best months. I can never decide which I love best. 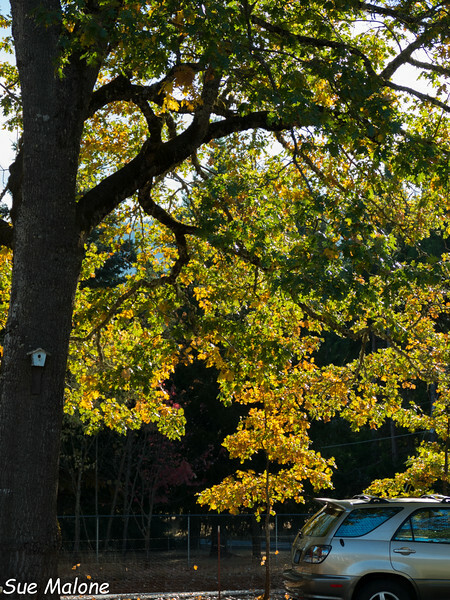 Springtime promise or the brilliance of gorgeous October days. It is the same with February and November, on the opposite side of the spectrum. Which do I like least. Both months require an artist’s eye to see something other than gloom. 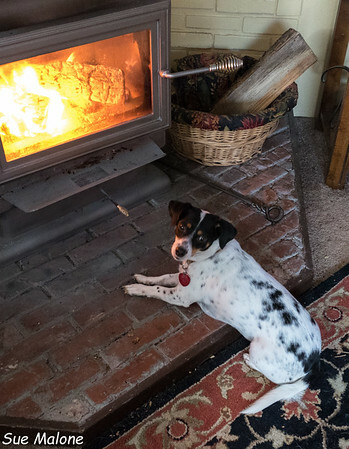 My friend Jeanne, back in Vermont, calls it “Stick Season”, an apt description. For now, though, it is November. 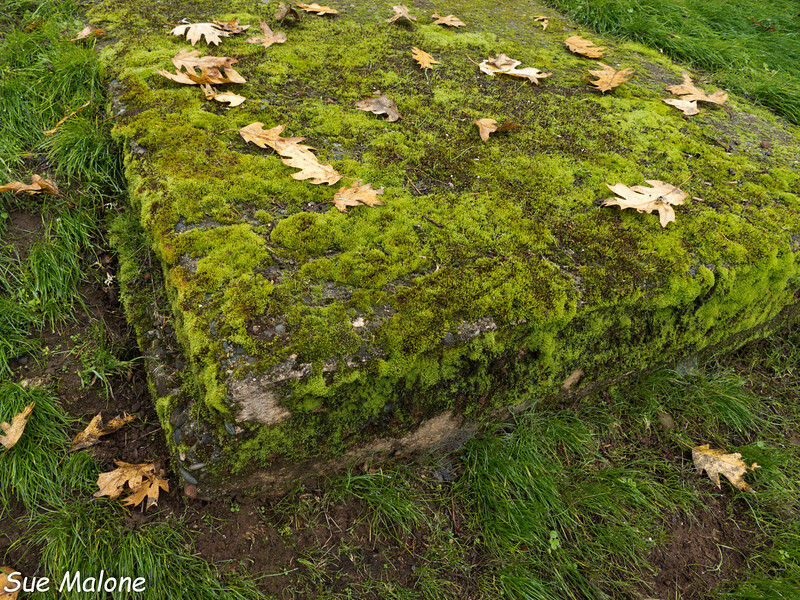 After the wettest October on record for Grants Pass, we are heading into winter. 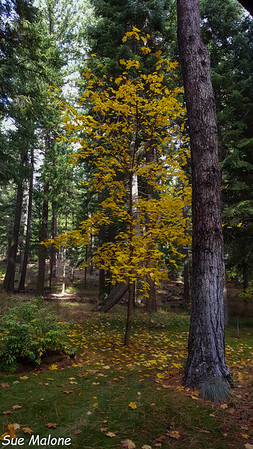 The last of the leaves on the east side of the Cascades have fallen, while the color is just past peak on the west side. We cross back and forth between these two worlds in about 2 hours, coming and going between our homes. When I say it is over, of course, part of what I refer to is “the election”. Yeah that one. Only time will tell if the dire predictions of one half of the country come to pass or the rosy promises of a bright future surprise the other half of the country. And that is all I am going to say about that here. The other thing that is over, the very good thing, is that the Rocky Point house sale is final. Closing went without a hitch, on the day it was supposed to, papers all signed, and money in the bank. Neat as a pin. Mo and I went there one last time, to pick up the random garbage cans, and load up the cleaning supplies and vacuum cleaner. I walked around the place, looking at the little trees we planted over the years that are now matured, remembering the sunny summer days we spent together working in the yard, bowling Bocci with the kids on the sloping lawn, cooking hot dogs on pitchforks at the edge of the forest over a campfire. I didn’t feel the least bit sad, even though I took some time to give myself space to grieve a bit. It wasn’t necessary. Amazing memories, and yet no sadness or regret slipped into the joy that at last it was over. Done. Now the new owners can plow that snow and blow that roof and drive 40 minutes each way to the grocery store. I haven’t had the time to keep up on blogs lately, reading a few that I love, rarely commenting. 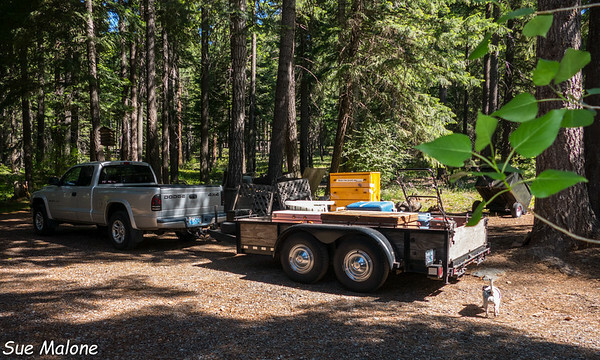 Until this past year, Mo and I traveled almost half the time, managing to get the rig out every single month for a few days or a week or a month, sometimes three. This past year that has slipped, and I do miss our travels. Mo said yesterday, “Well, we have a choice. We can have a home or we can do all that other stuff that we enjoy. Eventually we will do both again, but not right now. Make your choice”. 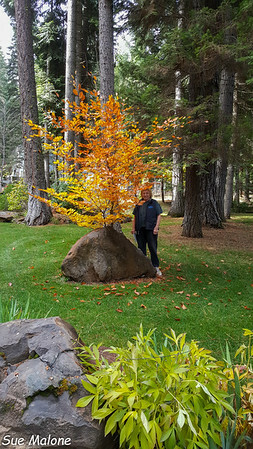 Mo planted this beech in 2004. It took almost 4 years for it to get above the rock. So I thought about it. 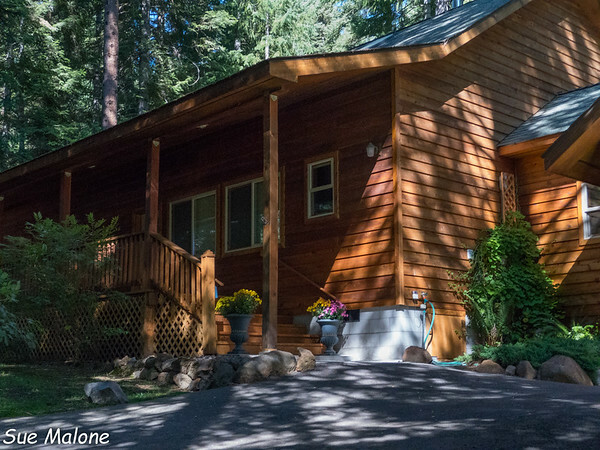 I spent a few moments thinking about how it would be to dump the idea of the house and simply keep living here at the apartments into old age, going to Grants Pass and the acre and the cottage, where the MoHo lives as a second home. But the bottom line is that neither of us have any desire to be “full-timers”. We want our home to return to when the road gets tiresome. And we are old enough that an exit strategy would have to be in place, and that exit strategy would include a home somewhere. Grants Pass is our exit strategy, our home for our last decade or so of life. For the few moments I tried to imagine letting go of life to come on the cottage acre and building a home there, replacing it with world cruises or full time RV life, I only felt rootless. Not freedom. Choices, it is always about choices. It was fun to consider the options and fun to reaffirm that our choice is the best one for the life we want to live. 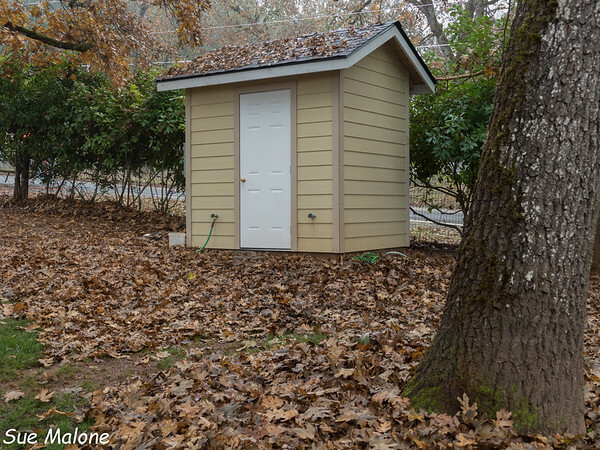 The pump house is finished, except for the final paint which will come after the house it built, and that sweet little building is filled with some serious high tech water management equipment. We have the main well, which pumps raw water into our first 1700 gallon cistern installed last year. A pump in that cistern sends water up to the first big pressure tank by way of a simple sediment filter, then that pressure tank sends water into the softening system. 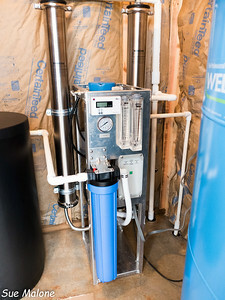 From there, the softened water enters the reverse osmosis unit, with two big membranes that purify the product water to less than 3ppm of anything. The R.O uses 4 gallons of water to produce 2.5 gallons of pure final product, which is then sent to the second 1700 gallon cistern. From that cistern, another pump sends the water back to the second pressure tank which then sends that pure, sweet, fabulous water into the house. The waste water product exits the system into a gravity flow drain area which will subirrigate the fenceline shrubs which seem to be tolerant of the salt content. Amazing system. Next year, when I start irrigating with this water, I will have to pay attention to the input and output of all parts of the system so I know just how long I can run whatever drip sprinklers we set up. 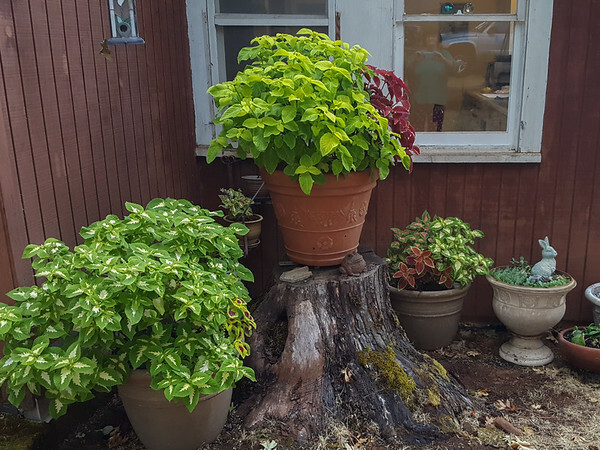 Some plants that we have don’t mind the salt, so I can use the raw water for them, but others that I took to Grants Pass had leaves turning brown and crispy, so those plants will get good water when all is said and done. I took a bath in that water, and oh my…what a treat. No scum on the tub, silky baby soft hair, and no iron to stain the clothes. I have said it before and will say it again. There is nothing quite as wonderful as really good water, no matter the price. If in the future, for any reason, we have trouble with the well and have to drill deeper, we already have the system in place to purify whatever water we get. It is a big deal. 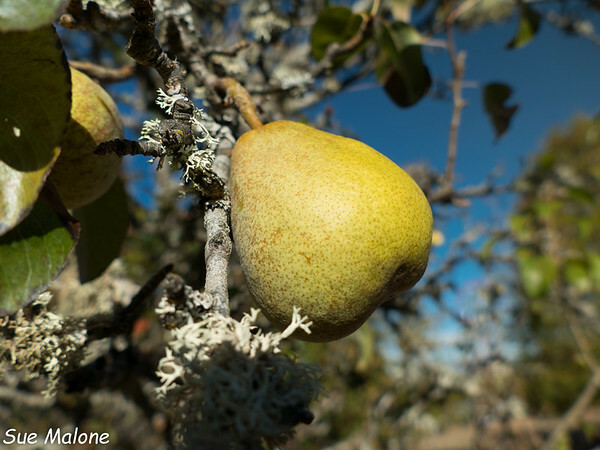 In late October, the “sand pears” were ready for canning. Hard as little rocks, these pears don’t ever seem to ripen, and when they fall off the tree, they are still very hard. 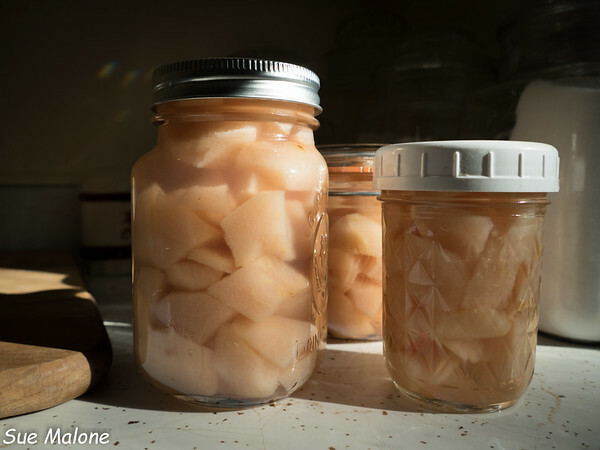 I learned that they are called “canning pears” and once peeled and cooked they give of a heady perfume in the kitchen, and instead of getting all soft and mushy they stay slightly firm and are incredibly delicious. We spent a week or so each time at the Cottage, with Mo still working on her wood shop, and I started the big annual project of raking leaves. 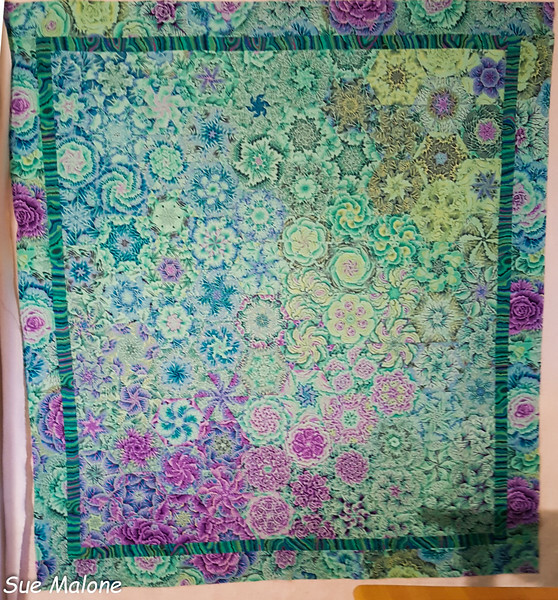 I would rake a few hours each day and then retreat to the kitchen table to do some more quilting, and finally finally at last I finished my One Block Wonder kaleidoscope quilt. This quilt was made from only one fabric, cut into a gazillion triangles sewed together into mirrored images creating the kaleidoscope effect. It was more challenging that I expected, and about 3/4 of the way through I decided that I really didn’t like it. I have learned that is a common response for me, however, and now that it is finished, I love it. The fabric was one I bought years ago, and is one of my favorites. 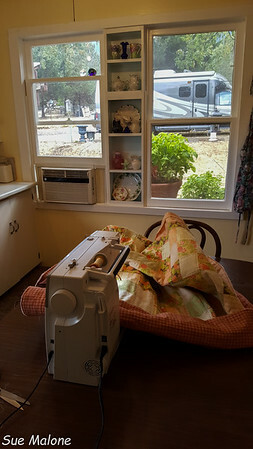 I will put the top away and wait to quilt it until maybe the aforementioned month of February, when a burst of garden color will be much needed. 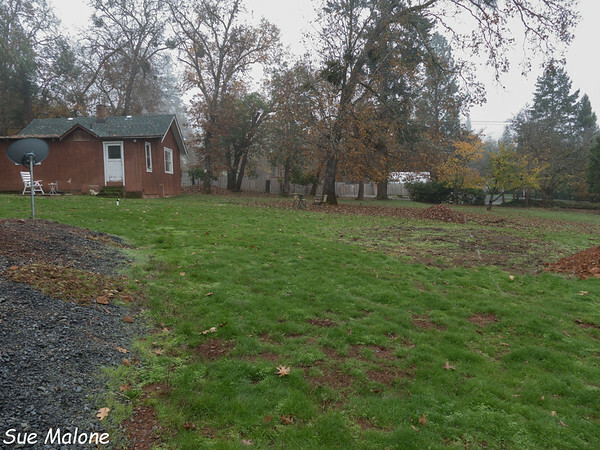 One thing about living on the west side of Oregon that natives understand is lawn grass. 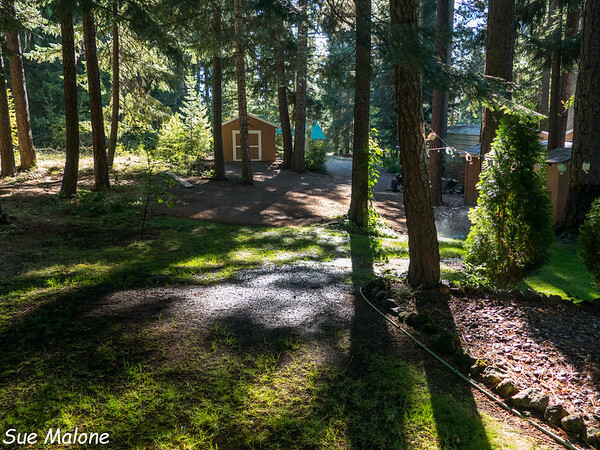 It is said that you can tell a true Oregonian by how brown their lawns are in the summer. I spend a lot of time and energy making sure that my little patch of “real” lawn grass at the cottage is nice and green, especially appreciated when the temperatures are over 100 degrees and the rest of the acre is a fried crispy brown. The most amazing transformation happens when the rains start. This year, instead of waiting until November, our rains started up in October, and literally, in a matter of days, the thin, crispy, brown stuff that you would swear was completely dead started greening up. Our acre went from hard and crunchy to green and lush in less than a week. A truly amazing thing to experience. One of the minor joys of living on the west side. It will stay green all winter, but Mo won’t have to mow until spring because the cool temperatures keep things in check. Mo and I worked together, loading leaves into the little trailer and making trips to the composting area of the county landfill. 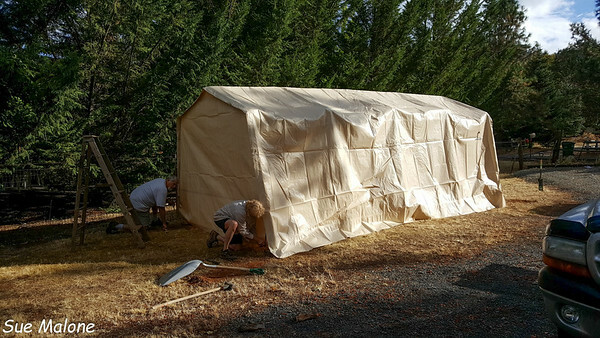 We learned after a couple of years in Grants Pass that this was a much better solution than trying to wait for the few burn days. The piles were incredibly huge, made some awful smoke, and required days of standing around with a rake and pitchfork to make sure nothing got away from us. The cost is more, but at least it benefits the environment more than all that smoke. Finally, finally at last, tomorrow we are ready to hook up the Tracker and point the MoHo toward the west. It may be November, it may be raining, but who cares, we are heading for the Coast. 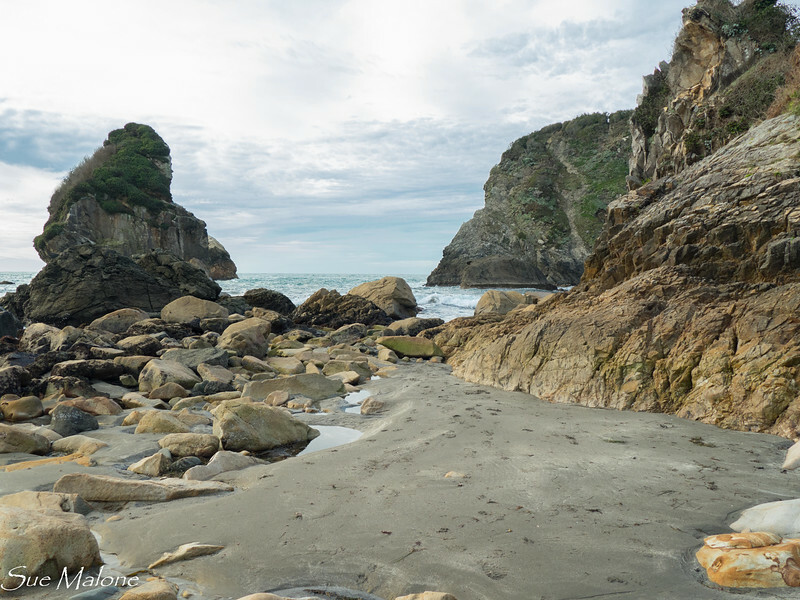 We haven’t been to Harris Beach all year, and are looking forward to a few days doing nothing but hanging out, walking the beach, hiking the trails, and eating fish and chips. It has been much much much too long! "I write because I don't know what I think until I read what I say"
I saw this quote on Facebook today, buried in the news feed filled with political rants, silly cat videos, and friends checking in about their welfare as the hurricane slams Florida. I really don’t think much of bloggers who complain about their writer’s block, and now look at me. If you don’t have anything to say, then don’t write. Everyone has their own lives and no one is really paying much attention anyway. I have rambled around in my own thoughts this past couple of months, thinking now and then that I need to write it to keep track of it, but finding no time and no motivation. Everyday life has completely taken over my thoughts, and I wake at 3am thinking of really stupid things, and none of them are relevant to anyone, even me. But then a couple of days ago, Mo asked, “Have you written any more about our Reunion Trip”. No. And this morning, she asked, “Have you written anything about our Transitions?” No. We talked a bit about this, and I acknowledged my writer’s block. Where do I start, I have no gorgeous photos of beautiful places we have traveled, no interesting tidbits about campgrounds, trails hiked, rivers kayaked, all the things I love to read in other blogs. Yet this is our life. If I don’t write it, the memories will just slip quietly away into the jumble and we will forget. I whined to Mo a bit about “Where in the world to start when it has been so long? 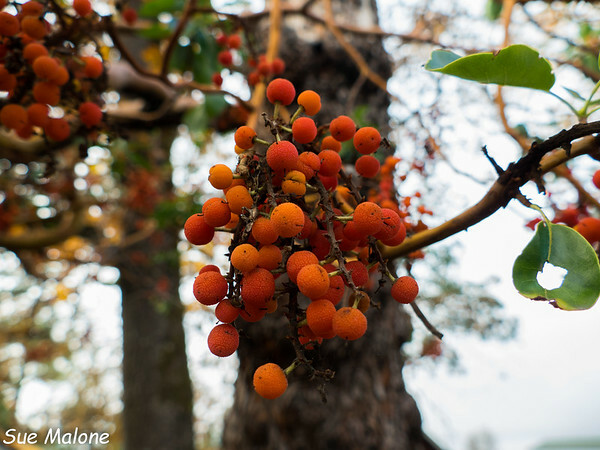 !” Then as I drove to town for my flu shot, I found myself enjoying the gorgeous fall skies, the blessedly cool weather, and suddenly I noticed I was “blogging” in my mind. When all else fails, those of you who have read long enough to remember, know that I fall back on the present moment to get started. So bear with me. I am going to ramble on about the present moment for the time being. Eventually, if you hang in there, maybe a few tidbits about the past couple of months will slip in as well. 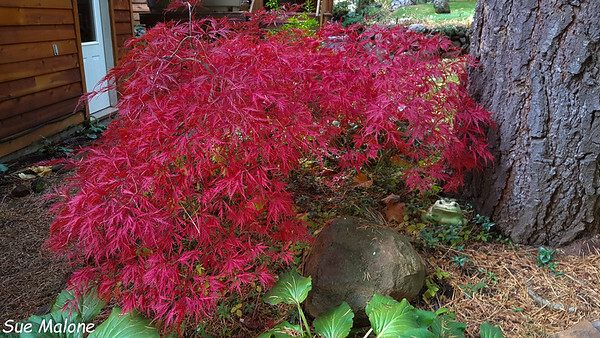 Fall has slipped in quietly this year, the colors just now starting to turn. I wonder if the usual October 15th maximum is really going to happen, or if it will be a bit later. Rains came early both here in Klamath Falls and in Grants Pass at the Cottage. Blessed rains. Last week the crispy, brown grasses of the non irrigated ground we have on most of our acre there turned soft, the ground turned quiet again, and the skies treated us to magnificent sunsets. 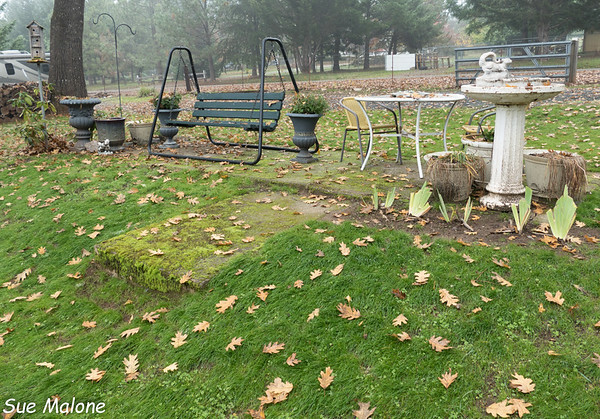 Mo and I sat outside one evening in our chairs on the grass in the spot that has been marked for the new house to come. 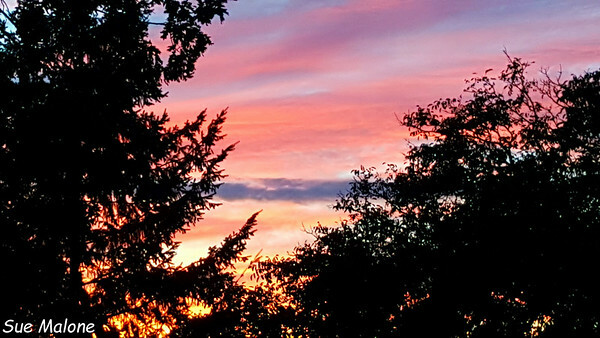 We were on what will be our lovely covered back porch as we had a glass of wine and watched that sunset. Everything is becoming more and more real. The Rocky Point house is sold. It sold in just under 5 months on September 1st. Everything is going well and closing is supposed to happen at the end of this month. We are encouraged because the buyers seem solvent, the financing is already arranged, down payment is large enough that the long awaited appraisal won’t be an issue when it comes. Appraisals in this area are hard to come by and sometimes the wait is 3 or 4 months. Sigh. Too much selling and not enough appraisers! Things are moving, even here in Klamath Falls, and much more so on the other side of the mountain with houses going for ridiculous prices and selling in a matter of days. Not quite California yet, but well on its way. Mo and I have spent the last few months since the house first went up for sale moving. We were grateful for the time to do it slowly, a trailer load at a time, and now that the deadline is approaching, we are glad that it isn’t a race to the finish. The required inspection showed a solid, well built, well maintained house, and our only required repairs were a GFCI outlet, a couple of wires in the breaker box, and a chimney cleaning. Pretty good for a 15 year old house, I would say. 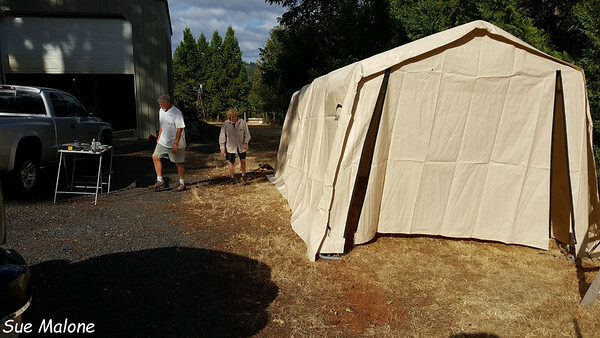 We managed to get everything from Mo’s big workshop moved to the RV shed in Grants Pass and there is still even room for the MoHo in there. We did have to put up a temporary shelter for the tractor. Mo’s brother Dan, the ever ready helpful Dan, came south for a couple of days to help Mo put it up, and now the tractor AND the MoHo are under cover. 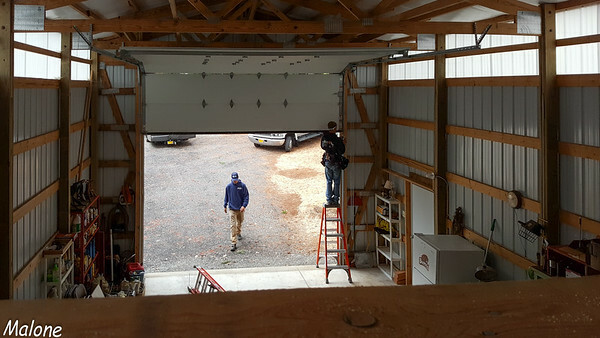 In addition the the big shop, we had a small storage building, the garage, the boat house, and all that yard stuff. We have always laughed about the “last load”. You know, that one that looks like everything from the last minute is strapped on, with the rakes hanging from the bikes? Well, we laughed again because a lot of our loads seemed to look like the “last load”. This Saturday really WILL be the last load, however, and not a rake in sight. We have 4 pieces of furniture that don’t fit in our current living space in Apartment A that will be moved from the house to Apartment B. My quilting and crafting apartment, also serves as a nice space for storage, with a lovely guest bedroom and bathroom as well. Looking at our calendar, most of our time these last few weeks has been spent either at Rocky Point or at the Cottage. Technically we live here in the Klamath Falls apartment, and at last things are slowing down enough that we actually get to be here more than 2 or 3 days at a time. And you wonder why I have nothing to write about? Back and forth on the same road, no matter how beautiful that road is, does not inspire eloquent thoughts. Moments of beauty, yes, but not much that stays with me. Now that the house is almost sold, almost closed, we are moving forward on the building of the new one. It is exciting. I am a Pinterest addict, looking at ideas, saving color schemes, granite counters, “vignettes” (does anyone even know what a decorating vignette is?) I didn’t until Pinterest. In the middle of house dreams, and driving back and forth, I managed to finish a baby quilt for sweet Georgia, another great niece for Mo, born in the middle of September. I had fun making the quilt, but it took me much too long, since I started it back in June. 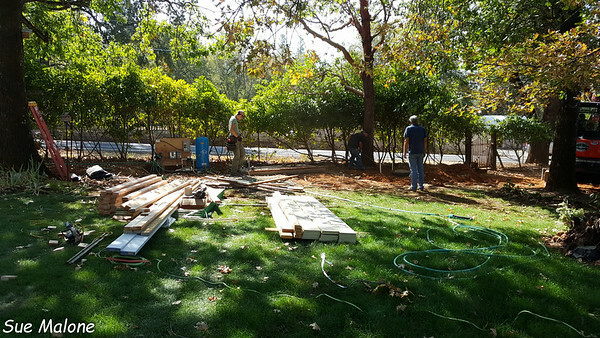 Last week our water guy started the upgrade of the water system, installing the second 1700 gallon cistern that will be clean and ready to store the magnificently pure and sparkling water that will emerge from the most complex water system you could imagine. Well pumps into the first cistern, pumps back up to the first sediment filter, into the first 80 gallon pressure tank, then through the water softener to remove iron and calcium, then through the reverse osmosis membranes (3 gallons of good water for every 6 gallons used), then into the second 1700 gallon cistern, to the second 80 gallon pressure tank and into the house. Pure, less than 10ppm of anything water. A high price to pay, but better than digging a new well which is like gambling. And neither of us cares to gamble to the tune of 15,000 bucks or so. We knew the well was a low producer and that the water had a salt problem when Mo bought the property. It is a common thing in that area, unlike Rocky Point, but I have to let go of Rocky Point water forever now. Ah well. 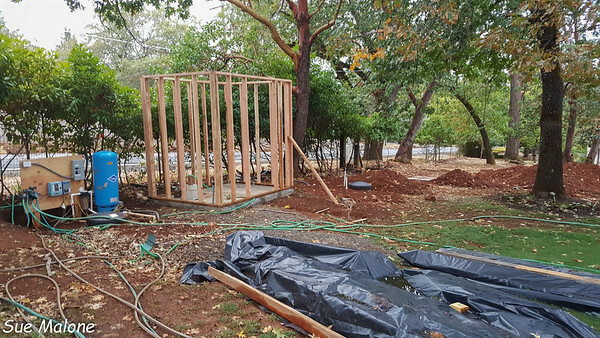 Our builder started the new pump house so there is someplace to put all that stuff, and the pump house is being constructed with the same materials that will eventually grace the new house. I got my first taste of decision making stress. The pump house needs a roof, and we want the roof to match the someday new house, so without anything to go on, we had to pick the shingles for the new house so those same shingles would be on the pump house. Quality, colors, prices, all going through my head at 3am. If this one decision is this hard, I can only imagine how the rest will be. 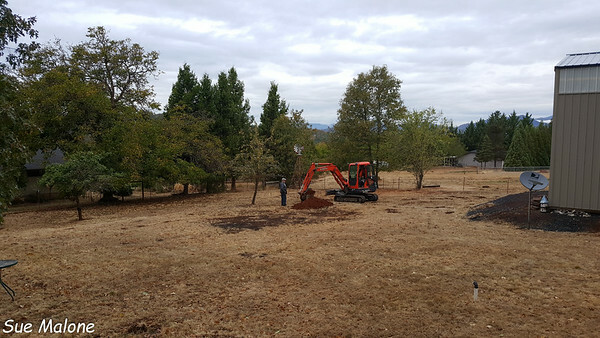 While the pump house was being built and the cistern was going in, the septic specialist showed up with his backhoe to dig our test pits. It will be a couple of weeks before the Oregon DEQ can test the pits, but with this soil we shouldn’t have any problem with the new septic approval. Loved looking at that soil. 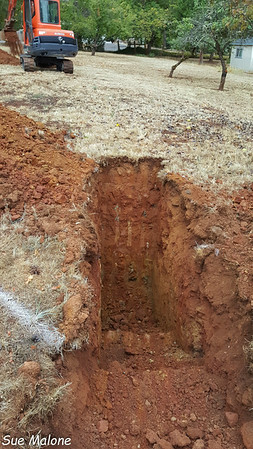 I spent 35 years jumping down into pits like these, both dug with a backhoe, and ones I dug by hand, to look at all the morphological details in a soil in place in the ground. I loved my job. We had initially planned just a single night at the cottage, but with the building going on we decided to stay another night. Our plans to go home on Sunday were again changed when the chain pulley on the big RV door decided to jump the post and tangled up so we couldn’t close the door. UhOh. We parked the MoHo in the shed, turned on a light or two, and hoped for the best. Lots of “stuff” in that shed at the moment, and leaving the door open all night didn’t feel very good to either of us. No problem, though, and nothing was missing when we got up the next morning. The door repair guys showed up mid afternoon, fixed the door, warned us about opening it just a bit too high, and we were able to pack up and head back over the pass for our current home at the apartments. Still, I enjoyed our extra days there, the coziness of the cottage is always fun. Daughter Deborah stopped by after work on our first night there and we had a great dinner and good wine and lots of fun conversation. She has very fond memories of her 18 months living in that little cottage and the time we got to spend together when Mo and I would be there. We will miss the little cottage, but not enough to try to repair the nearly 100 year old plumbing and wiring. 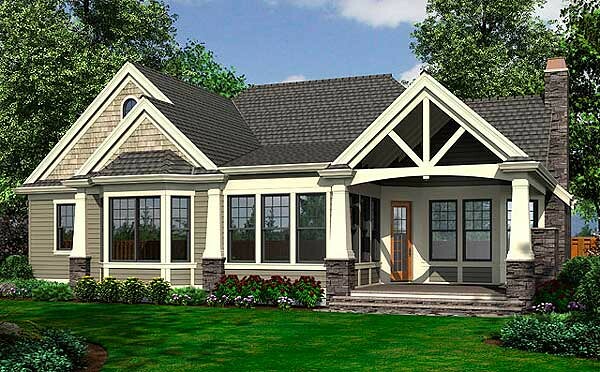 A new house is a must. Our only camping trips this summer were the early trip to the coast in April, and the Reunion trip in August. We are both feeling really antsy to get somewhere! I am pretty sure that “somewhere” will be a trip to the coast in November sometime after the closing has completed. Ah, the ocean, fog, rain, none of it matters, being at the coast in November is always magical. The crowds are gone, we can hole up in the MoHo, walk in the rain, hike down to the beach, eat fish and chips. 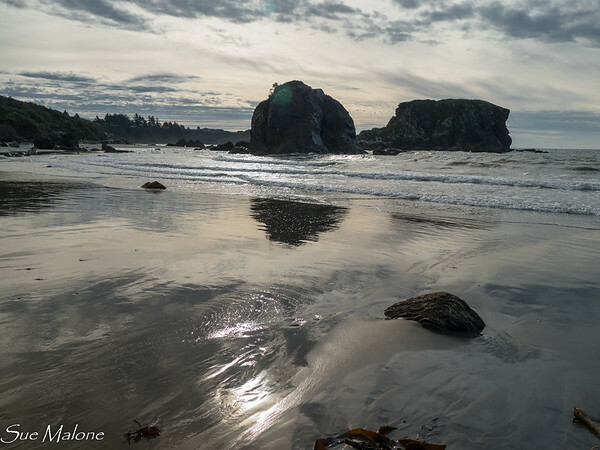 A trip to the coast is always healing for both of us. We only have one big exciting thing planned at the moment, and that is a trip south in late December, when we will travel with Adventure Caravans for 8 days immersed in the Pasadena Rose Parade festivities. We have wanted to do that since forever, but never thought we could manage the traffic or the complexities. Enter a “rally”, our first, and we can just let them handle the traffic and we get to participate in all the fun stuff like seeing the floats being built, seeing the advance horse show, and the advance band show, seeing the parade from the bleachers by the HGTV cameras. I am beside myself excited about this one, and at the moment, I can smell the flowers. I remember that smell from every single year of my growing up, when we went to the Rose Parade, and even some nights when I camped in a sleeping bag on Colorado Boulevard to get a good spot. The best part is that a pair of our very most beloved friends are going to join us on the trip, but I’ll leave it up to them to tell you who. And speaking of friends, how is it that I am so incredibly glad that Erin is back in the country after her long sojourn over the summer. Always available by text or email, or now and then on Facebook, somehow it is just different when they are back in the states! 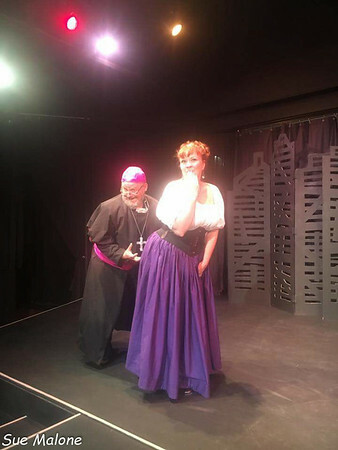 More fun news is that daughter Melody has had a great run in her most recent play with the Linkville, “Jekyll and Hyde”, and loves her job at the Ross Ragland. Grandson Xavier has the starring role in “Superman, the Musical”, which will be performed on the Ross Ragland stage in January. Grandchild Axel bought a car and has worked for almost four years now. No millennials living in our basements at the moment! A very responsible human being and I am proud. Deanna and Keith at an Irish Pub on the Greek island of Santorini. Daughter Deanna and her husband just returned from a great trip to Santorini, Greece, not just a cruise ship day, but a couple of weeks in a rather cute traditional home that looked a bit like an old cave. My son, John, in Missouri, seems to be doing better and is finally getting the medication that he needs to battle his own health issues. 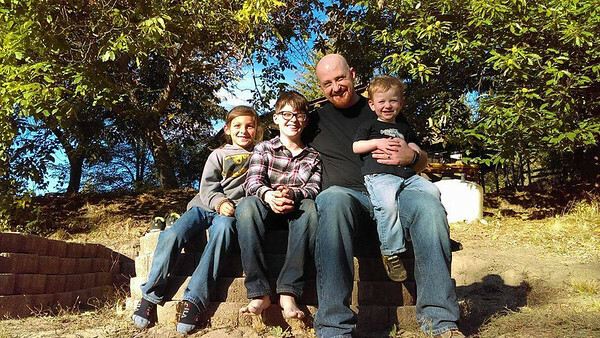 Great Grandson Orion, Matthew, Grandson Steven, Great Grandson Theron. My grandson Steven now has his eldest son Matthew living with him in Northern Washington, a good thing. And daughter Deborah’s son Matthew is now living close by near Grants Pass. It was heartbreaking for Deborah that he was so far away in Colorado, and she is happy to have him close again. Life does just keep bubbling along, doesn’t it. Except when it doesn’t. 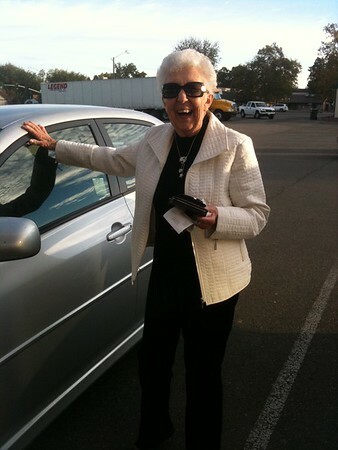 My sweet mother-in-law decided that 93 years was enough for her and passed gently last week. 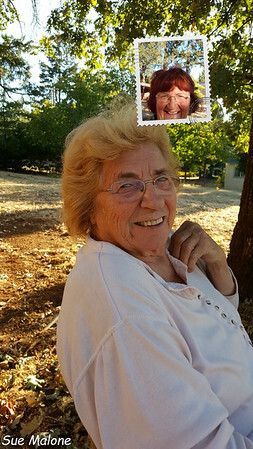 She lived a good and magnificent life, was loved fully by her son, her husband, both now gone, her grandchildren, her friends, and was a classy lady all the way. I was so blessed to have known her and to have shared so many years with her.